It is a moment when true Presence breaks through all our defenses and veils of fear. We experience profound relief and peace in this holy instant. In our healing of Harvey the Cat over the past nearly three months now, we have had many glimpses of his restored health. We have had days when his breathing was almost “normal” again. We have had days when his legs seemed strong again. We have had days when his appetite seemed very hearty. All of these were the holy instant. And we have had other days where I felt very discouraged, and feared we had lost all the progress we had made. Barely more than a week after his miraculous turnaround during the first hospital stay, we were back in the hospital. This time his situation was not nearly so dire, but I would be lying if I said I felt happy about being there again. What is important to keep in mind in the healing process, is that our goal is to enter in to the holy instant more and more frequently. In the holy instant, the veils of fear are removed, and we can see the real world. In the real world, there is no death, there is no suffering, and there is no sickness. Think of it like approaching a very dirty window and rubbing your finger across one spot. In that one clean spot on the window, you can put your eye up to it and see clearly through the window. Yet if you step back again, the overall picture is still dirty. The function of the Holy Instant is to clear the entire window, one bit at a time. This requires patience and an enormous amount of trust. Many people I’ve worked with over the years have experienced the holy instant but given up when the holy instant was not permanent at first. They gave up before they could have had their biggest miracles. That’s why it’s important to know that this path of healing is a 24/7/365 commitment. Being half-hearted about it means losing the holy instant. Whereas our goal is to begin living the holy instant more and more and more frequently. This is why I talk so frequently in Holistic Belief Reprogramming about the power of investment and commitment. Without commitment, I would have given up on Harvey the Cat long ago. Likewise, the time and money I’ve now invested in his healing has only made me more committed. Once we have experienced the Holy Instant, it becomes addictive. The peace we experience in the Holy Instant is so miraculous and profound, that we want to experience it over and over and over again. So don’t give up … stick with it … at the end of the day, the rewards of the holy instant will be worth it. 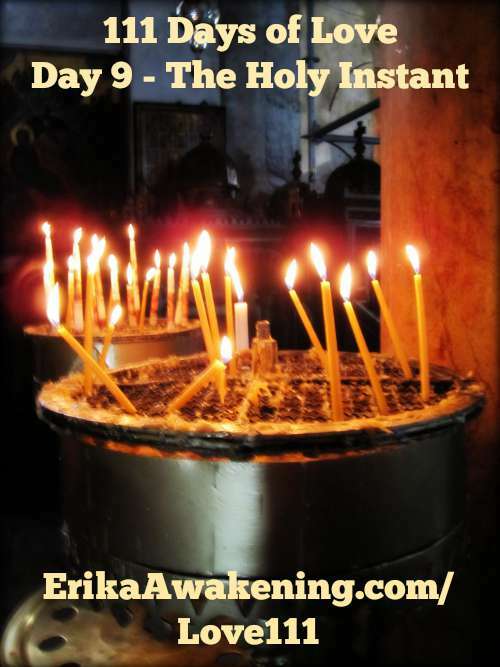 To experience the holy instant in sessions with Erika Awakening, check out our coaching options here.